Add Florida to the list of key swing states where the weakness of the Republican front runners for President in 2012 would allow Barack Obama to win again if the election was today, despite his own less than stellar poll numbers. Obama leads Mike Huckabee, Newt Gingrich, and Sarah Palin by greater margins than his victory over John McCain in the state in 2008, with only Mitt Romney running closer to Obama than McCain did. Obama's approval rating in the state is just 45%, with 49% of voters disapproving of him. His numbers with Democrats leave something to be desired at just a 69/24 approval spread and Republicans predictably are pretty universal in their disapproval of him at 81%. But his numbers with independents are among his best anywhere in the country at 59% approving and 35% disapproving of him and that puts his overall numbers at least at a respectable level. Florida voters may not be enamored with Obama but they don't really like the leading Republican contenders either. Sarah Palin is incredibly unpopular at a 36/57 favorability and Newt Gingrich isn't a whole lot better at 36/47. Mike Huckabee's numbers are more respectable at a 41/43 spread and only Mitt Romney has more voters with a positive than negative opinion of him at 43/38. Romney comes closest to Obama in the hypothetical head to head match ups but still trails 46-44. You might think that with Romney having postive favorability numbers and Obama's approval under water that he would be in the lead. The problem for Romney on that front is that while 31% of Democrats like him, only 20% of them are actually willing to vote for him against Obama. On the other hand pretty much everyone who likes Obama is also committed to voting for him. What would really help Obama's chances of taking Florida again is if the Republicans nominated Sarah Palin for President. Obama leads her by a stunning 14 point margin, 52-38. The last Democrat to take Florida by such a large margin? Usually you just have to go back to LBJ and Barry Goldwater for those comparisons but for the Sunshine State you actually have to go even further to Harry Truman's election in 1948. Part of Palin's problem is hesitance on the part of Republicans to support her- she gets only 63% of her own party's vote- but her biggest issue is independents where she trails Obama by a whooping 41 points at 67-26. We've had a lot of polls show that Palin would be a disaster for the GOP but this might be the starkest evidence of it yet. Mike Huckabee and Newt Gingrich each trail Obama by 5 points, a margin slightly larger than his victory in the state in 2008. It's 49-44 against Huckabee and 47-42 against Gingrich. Obama's relatively weak approval numbers in Florida make it clear that he could lose the state in 2012 and against Romney he'd start out in something approaching a toss up. Beyond that though if Republicans want to win Florida their candidates either need to really step up their games...or they need to find some fresher, stronger candidates. I just don't understand the "unlove" for Palin. Sure, her IQ is probably around 90, but that's still much higher than Elvis' allegedly was and he is STILL one of the most popular and beloved icons of this or any era. Palin is not significantly less intelligent than the greatest president of this century, Dubya. I think it may have to do with the fact that picking a president is just a bit different than picking a record to put on the jukebox. Elvis and Palin are both entertainers; the difference is that Palin has a substantial number of delusional fanatics behind her who genuinely do think she should try for political office again. 'Not significantly less intelligent than Dubya' is one of the best 'damn with faint praise' statements I've heard all year, though. Good news indeed. Again and again you guys are finding that of the GOP big four only Romney has a good shot against Obama and you're also finding that GOP primary voters are too conservative to go with him... Double good news for people like me that want to see President Obama win a 2nd term. "Good news indeed. Again and again you guys are finding that of the GOP big four only Romney has a good shot against Obama and you're also finding that GOP primary voters are too conservative to go with him... Double good news for people like me that want to see President Obama win a 2nd term"
Too funny!!! Dude, This is the DailyKOS poster; what else do you expect them to say?? These guys existence depends on placating that crowd and making sure the Obama KoolAid is passed around as much as possible. As much as you would like be ecstatic with these numbers, I would be wary of these guys. Last month, they posted a poll that showed Obama with a Job Approval of 50% in Virginia; Claris research, an independent pollster, just published a survey which showed Obama with a 36% approval in Virginia. Who to believe??? Given that Obama is one month removed from a wipeout in the Mid Terms and the lowest approval levels of his term, magically PPP has him surging everywhere. Duh!!! Just remember, it doesn't take much for these guys to jigger their polls to appease their sponsors and their Dem base - especially since the Dems were obliterated a month ago. I would look for confirmatiom from other posters before becoming too ecstatic. Smooth Jazz - PPP is one of the best pollsters around. They have a reputation based on their many accurate predictions in the past. The reason the Democrats lost so badly in the midterms in Virginia (and in many other places around the country) is poor turnout among Democrats. That will not happen in 2012. You right wingers are delusional. Hopefully so delusional that you end up with Sarah Palin as your nominee. 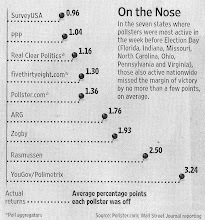 PPP had one of the best performances of any pollster in 2010, as Nate Silver pointed out. The Republican-skewed weighting of that Roanoke poll was dismantled in the comments to another posting. I was surprised to see that despite Palin's poor overall performance, she does remarkably well with Hispanics - the only Republican to actually win their vote (by a +8 margin no less, though the MOE on this is significant.) Even native son Rubio can only tie it. Could you possibly try to explain this poll result? I first thought that it was possible the hardliner Cubans would be supportive of her presumably hawkish policy on that, but her approval rating among Hispanics is atrocious - 33/57, far worse than any other Republican candidate; at least 9% of Hispanics dislike her but are voting for her anyways. Why is it that so many Hispanics are willing to vote for a Republican they loathe, but not a Republican that they like?